As we all know, birding a patch is all about windows of opportunities and I almost missed the Whinchat window! 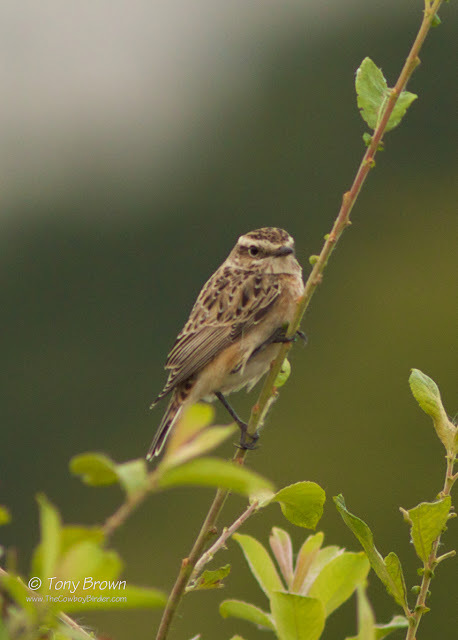 Whinchats on Wanstead Flats have been difficult to catch up with this year, having missed a couple of Spring birds (always more difficult and not guaranteed), I was starting to worry that I would struggle to connect with any passage Autumn birds. Numbers appear to be down on previous years, where you could expect to see family parties of up to six birds flying between the Brooms and the tall Rosebay Willowherbs, we've only had one or two birds and none have have stuck, all quickly moving on - possibly due in part to the reduction of good cover because of the City of London Corporation's decision to return the Flats to how it vaguely looked back in the 1970's, with the removal of large parts of the Broom Scrub. But on Sunday I was somewhat relieved to finally get one - just the one, but that's good enough. This was quickly followed by a Tree Pipit also a year tick - number 98. So things are looking rosy again and I'm just about on par for the year, with hopefully number 99 and 100 just around the corner - let's hope it's a couple of Autumn goodies to get me over the line.